Let us handle all the details for your wedding of up to 25 family members and guests. 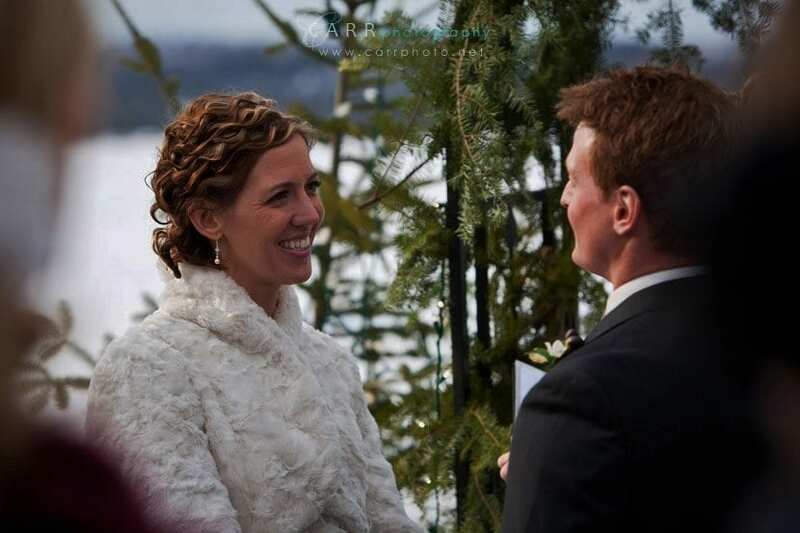 Ceremony site, groom’s dinner, wedding dinner with wine and champagne, wedding cake, lakeside accommodations with fireplace for all attendees, and all meals. Instead of hundreds of decisions, juggling countless details and wondering if you’ve forgotten anything, you can relax and leave the details to us. You can focus on being with your loved ones for this special event, and we’ll handle the juggling. We provide two nights of accommodations, including a cabin for the bride’s parents and a cabin for the groom’s parents, one cabin for the bride and her attendants and another for the groom and his groomsmen. We’ll also provide up to six more cabins for family and guests, accommodating up to a total of 25 people. The groom’s dinner is the first evening. It’ll be on the informal side with three entree choices and two glasses of wine or beer per person. Depending on the time of year and weather, this could be an outside cookout with your choice of steak, fish fry or BBQ. The wedding dinner is the featured food and beverage event of the weekend. After your wedding ceremony, we include appetizers and beverages for your reception. Beverages include beer, wine and cocktails. This will be followed by your wedding dinner in our main dining room. We have a qualified staff person who can present the wedding vows if desired. NOTE: The bride and groom will need to bring their blank marriage license with them. This can be picked up at any county in Minnesota and must be purchased at least 5 days prior to the wedding day. It is good for up to 6 months. Package Includes: 2 nights accommodations, wedding ceremony, all meals, and all activities. Just returned from [our] Wedding at Gunflint Lodge. It was wonderful and first class all the way. The accommodations are really great. They have beautiful cabins in a great location, our cottage was very clean and cozy, everything we needed was right there. The owners and staff are absolutely the best. They worked very hard to make the wedding weekend a great success and every staff member I encountered was friendly and professional. The food was tremendous and everyone had a smile on their face. . . I am already plotting to get back to Gunflint Lodge this winter, it is truly a First Class operation.